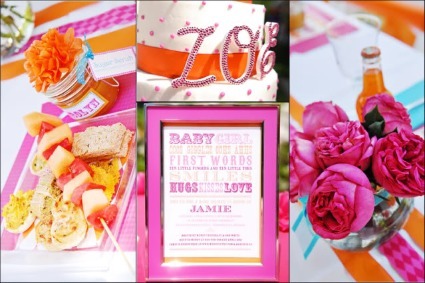 This "Pink and Orange Baby Shower" is perfect in every way - and we just had to share it with you! The festivities were created and hosted by, the talented, Wendy Updegraff, of Wendy Updegraff Photography! Wendy's mom also helped plan the event. The baby shower was for Wendy's sister and niece Zoe. 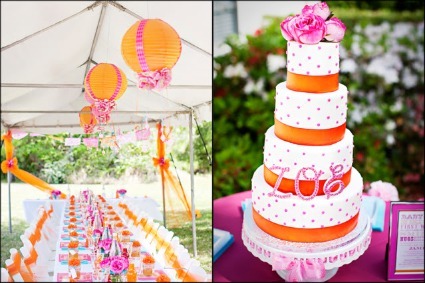 I love the orange paper lanterns that have been draped with pretty ribbon. These colors really POP together! What a beautiful cake - the polka dots and pretty flowers on top are so cute! Can you believe that stunning flower letter "Z" for Zoe! Love! 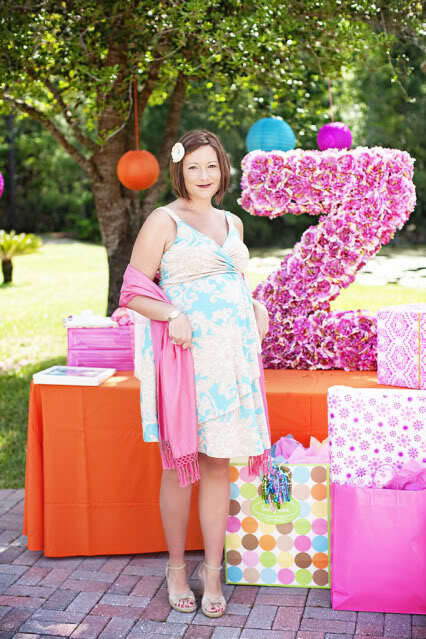 Even the baby shower gift wrap is color coordinated! The food table backdrop is genius! 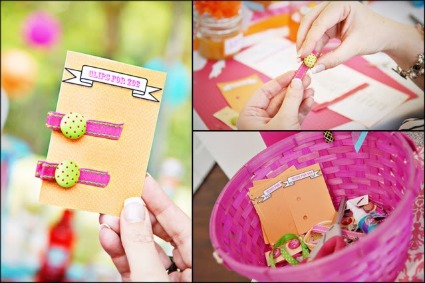 Attach pictures of the mom-to-be and family to ribbon and add to a fabric-covered board. Adorable and affordable! To give the food dishes height and contrast, place them on covered boxes of different sizes. Guests could make cute little hair clips for the new baby! 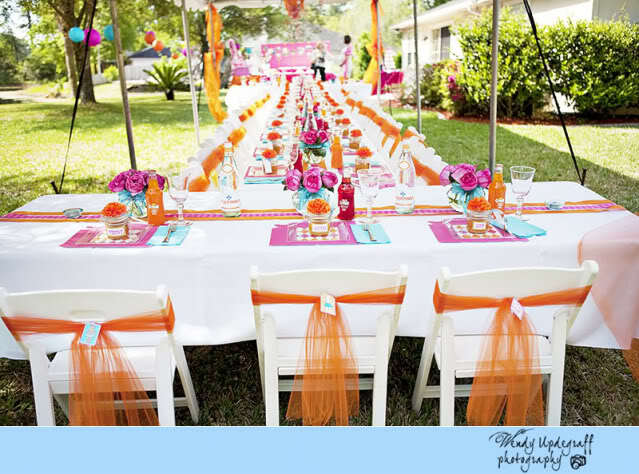 You could also do this with stretchy cloth headbands where guests add flowers or other embellishments. Onesie decorating is also a popular baby shower activity. Yummy fresh fruit kabobs, sandwiches with the crusts cut off and deviled eggs make the perfect finger foods for a baby shower. You don't have to spend a fortune and get too fancy to make a cute impression. 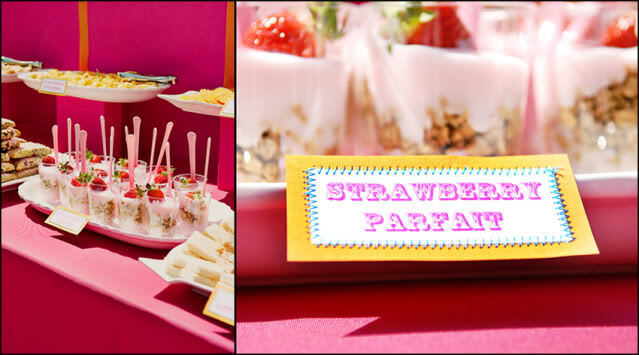 Place strawberry yogurt in clear plastic cups, layer granola in the middle and you have instant fruit parfaits! I love how the white chairs have been dressed up by tying a simple strip of tulle around the top! You can easily make cute place settings by using matching scrapbook paper as a place mat. If the weather is hot, you can also have cute hand fans for each guest. Hope this shower inspired you with great ideas! 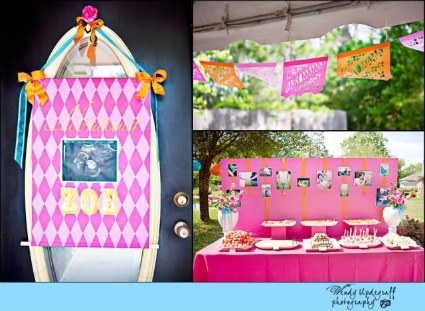 A big thanks to Wendy for letting us share her beautiful "pink and orange baby shower" masterpiece!